ID changes and upgrades, on the unlikely occasion that the person who's supposed to work there hasn't vanished. Customs is located in the entrance to the Bridge and opposite from Security. Inside is an ID computer, an alert terminal, a QM Request Console, a bank terminal, and a uniform manufacturer. This is where many players rush to immediately to beg for a better ID. This same office also has a desk facing the entrance to EVA so that the people working here can suit up in an emergency. Customs is located directly north of the trading dock and main hangar, i.e. far away from the arrival shuttle. Inside is an ID computer, a security terminal, a bank terminal, and a uniform manufacturer. This is where the Head of Personnel starts the round and where many players rush to immediately to beg for a better ID. This same office also has a desk facing the entrance to the bridge, so that anybody working here can be yelled at from two directions at once. There is no vent, so unfortunately anybody working here can't be yelled at from a third direction. The APC for this room is near the Command-access door, which leads into the Head of Personnel's Office. On Destiny, Customs and the HoP's Office are one and the same. Customs is located towards the Fore (North) end of the NSS Destiny, just below the Captain's Quarters. The Head of Personnel works here, ostensibly as the local human resources manager, and there's a Bank Records computer, ID Computer, and Personnel Equipment manufacturer just for that purpose. This is where many crew members go to request access changes or apply for job transfers and promotions. There's also a set of judge's robes and wig, in case Security suddenly feels like holding a trial rather than simply sending criminals to the Brig as Space Law recommends, if the Security Department is staffed at all. ID changes and upgrades, on the unlikely occasion that the person who's supposed to work there hasn't vanished into the Bar. As on Destiny, on Clarion, Customs and the HoP's Office are one and the same. Customs is located towards the center of the NSS Clarion, just below the Bar. 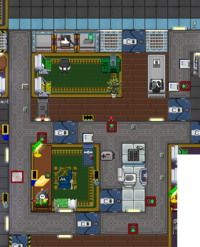 The Head of Personnel works here, ostensibly as the local human resources manager, and there's a Bank Records computer, ID Computer, and uniform manufacturer just for that purpose. This is where many crew members go to request access changes or apply for job transfers and promotions. 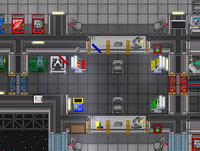 Customs is a special place on the very southern end of the station where Staff Assistants and other promotion-seekers go to get transfers to other departments and/or have their access levels upgraded by the HoP. In addition to the essential ID Computer, it also has a uniform manufacturer, which doesn't really manufacture uniforms (though it does manufacture dapper formalwear), and a Security Computer, so that the HoP can check that the guy who wants access to Toxins doesn't have any notes saying he's a ne'er-do-well nerd. If you're looking to get a transfer and/or promotion here, you might want to be here within the first 10 minutes of the round. 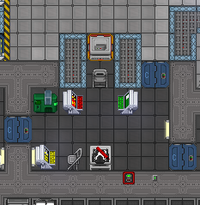 Heads of Personnel are easily bored and tend to idly wander about the station when they're not getting job transfer/promotion requests, so you better get your request in before they wander into Engineering and never wander back out. There is no vent. Maybe that's why the Head of Personnel likes to leave this room as soon as possible. The APC for this room is on the southern wall, near the entrance into the HoP's personal quarters. There isn't a room explicitly called "Customs" on the station, but the little alcove with the Identification computer near the Bridge is a pretty good place for ID-changing. 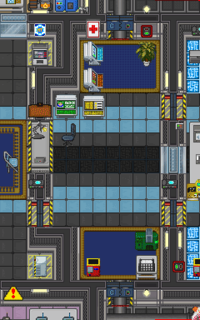 So is the little Security Checkpoint in the Shuttle Bay, though some may be put off by the very fat and very sassy bee. There isn't a room explicitly named "Customs" on this donut, but the Security Checkpoint in the Shuttle Bay and the judge's stand in the Courtroom are all good places (and the only places, at least at roundstart) to change ID levels. Are you an ambitious Staff Assistant looking to climb the station ranks? Need more flour and meat for your latest creation but don't have the means to procure more of them? Were you assigned to slam people's faces with medical patches but yearn to slam people's faces with batons? Do you just want to scan just about everything the station has to offer? Then Customs is the place for you! Just cross the central airbridge, make a right towards the Brig area, go south once you reach Medbay lobby, go straight through the Courtroom, and you'll be right where you ought to be! Asking for a promotion is super simple; even a Monkey could do it. Just ask the kind one in green and blue what you want access, give a reason why, and hand them your ID card. They will then consult the Security Computer to check your criminal file and perform a background check. Once you pass, they'll put your ID in the ID Computer, set the appropriate levels, and hand your card back to you. It's that easy, and it takes place in just seconds! If the HoP is not there, just call for them over the radio. If you need a temporary change of uniform, there's a uniform manufacturer for generic jumpsuits, plus a rack of linens to resupply it. If you want a matching salary change, just ask the HoP to change it at the Bank Records computer in the corner. If you need a judge for your trial, the judge wig and robes to clothe them are here too...for some reason. Customs is huge wooden room right of the Bridge and across the hall from the Courtroom where enterprising employees go to request and (hopefully) receive ID upgrades and transfers from the Head of Personnel. In this particular setup, they wait in this nice wooden lobby, which a huge step up from the usual standing-in-the-hall approach and the cramped corridor of sister stations. If any employees also want a raise, they can also ask the HoP to adjust their salary in the Bank Records computer. They can also request a new change in uniform from the uniform manufacturer or a fancy access implant from the Personnel Equipment Manufacturer. There is no vent. Promotions don't need air. 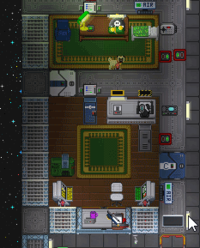 The APC for this room is near the top left, right near the Command door into the green-carpeted area. This page was last modified on 23 November 2018, at 20:54.